Airedales are medium-sized, with an AKC breed standard height of approximately 23 inches at the shoulder. Females are slightly less. Typical weight for females is 40-50 lbs., with males slightly more. The coat is wiry, black and tan in color, with a softer undercoat. 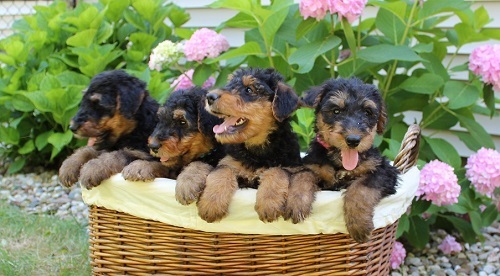 An Airedales temperament is more reserved than that of other terrier breeds, though they are self-confident and should not be shy when meeting new people. Airedales are intelligent and playful, and patient with other pets and children.